Sports Illustrated is one of the many national media outlets to cover the story of the shooting of Aplington-Parkersburg High School football coach Ed Thomas. Thomas was shot and killed one week ago and former player Mark Becker is charged with first-degree murder in the crime. Coach Thomas’ picture is on the cover of this week’s issue of Sports Illustrated –something writer Lee Jenkins says is unusual for a high school coach. Jenkins says,"I don’t recall that ever happening and I think that’s a testament to Coach Thomas’ life but it’s also kind of a statement about the universality of coaches in small towns and the impact that they can make." He says the cover story is a testament to the tremendous impact Thomas had both on and off the field. "The circumstances surrounding it obviously are tragic and compelling but I think the main thing is, that I hope people take away, is the compassion of this town, the impact this person made,’ Jenkins says. Jenkins says he didn’t know much about Thomas before the shooting, other than the school’s history of producing NFL players and his involvement in the recovery from last year’s tornado. Jenkins says he quickly realized how everybody in Parkersburg seemed to have a positive connection to Thomas. "It seemed like everybody either had a son who played for coach Thomas or their father, or they played for him, or he taught them how to drive, or he filled in as a minister at their church, or he counseled them when their wife or mother was suffering from cancer or M-S. Everybody had a story like that, he clearly was a pillar of the community," Jenkins said. 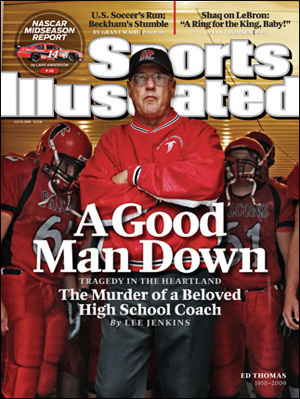 The cover featuring Thomas’ picture reads, "A Good Man Down, Tragedy in the Heartland, The Murder of a Beloved High School Coach." Thomas was buried Monday in Parkersburg.